For the examples below, you may want to follow along in the Handicap Parameters form available under the Setup menu by selecting Handicap Calculation Parameters. When a player has 1 score, the only score (no scores are discarded) will be used for a handicap. John has 7 scores available. Only the last 6 scores are selected for consideration. (Events 7-2). The best 4 of these 6 scores are used to determine the handicap. Assume 35.0 is the rating and 110 the slope for all scores. Suppose you want to calculate a simple handicap by averaging the last three scores. How would the CUSTOM HANDICAP parameters be set? Suppose you want to calculate a handicap by selecting 3 out of the last 5 scores. When you have 5 scores you want to drop the high and low scores and use the rest for handi­capping. How would the CUSTOM HANDICAP parameters be set? Assume you want to calculate a handicap by selecting the best 3 out of the last 4 scores, but do not want to calculate a handicap until a player has 4 scores to look at. How would the CUSTOM HANDICAP parameters be set? 1, 2, 3 SCORES available - No handicap calculated. 4 SCORES available - High score dropped, other 3 selected. A handicap is calculated! 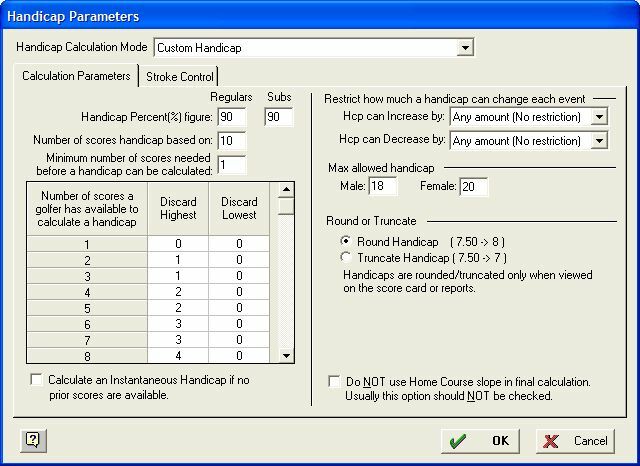 Note: Handicaps are automatically carried forward to the next event if not enough scores are available to calculate a handicap. This means if you manually enter a handicap for a player in event 1, and he/she does not have enough scores to calculate a handicap, it will be automatically carried forward to each successive event until a calculated handicap can be established.